Betty J. Koch, formerly of Williamsport, passed away on Thursday, Dec. 28, 2017, at the Bradford County Manor Home, Troy, Pa.
She was born in Williamsport, on Feb. 12, 1928, to the late Charles and Lillian (Smith) Tupper. Betty was baptized as one of Jehovah’s Witnesses on Sept. 20, 1958. She remained faithful in bearing witness to the good news of God’s Kingdom long after her health began to fail. Betty graduated from Williamsport High School in 1947. Her first job was at C. A. Reed Co. where she worked as a secretary. She was last employed by the Williamsport School District. Her interests included her ministry, gardening, listening to music, entertaining friends and reading, especially from the Bible. She loved her cats. 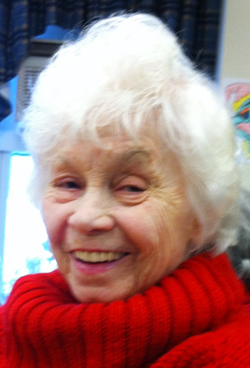 Betty enjoyed traveling and for many years vacationed in Ocean City, Md. with her two daughters. Betty is survived by two daughters, Faith M. Koch, of Williamsport and Carol A. Lash, of Canton; a brother, Robert Tupper of Dallas, Pa.; and a sister, Ruth Calistri-Grieco (Carmen), of Williamsport, along with 5 grandchildren: Joyce Craul, Natalie Route (Dennis), Brooke Tillotson (Paul), Michael Acresti (Laura) and Teresa Collins. She is also survived by several great-grandchildren and 2 great-great-grandchildren; as well as many nieces and nephews. In addition to her parents, she is preceded in death by her husband, Werner R. Koch; a daughter, Joyce Elizabeth; and a grandson, Rodney Aderhold. Funeral services will be held on Thursday, Jan. 4, 2018, at 1 p.m. at Maneval Allen, Redmond Funeral Home, 500 W. Fourth St., Williamsport, with Jerome Floyd officiating. Family and friends are invited to call at 12 noon until the time of the service. Betty would prefer that any memorial contributions be made to Watch Tower Bible and Tract Society of New York, Inc. Attn: Accounting, 900 Red Mills Road, Walkill, NY 12589-3223. To leave your fondest memories or condolences, please visit www.jamesmaneval.com.